UCJ is an “open and affirming” church, which means that we practice a philosophy of “radical welcome” to all, including all races and classes, and sexual orientations. No matter who you are, or where you are on life’s journey, you are welcome to come worship with us. 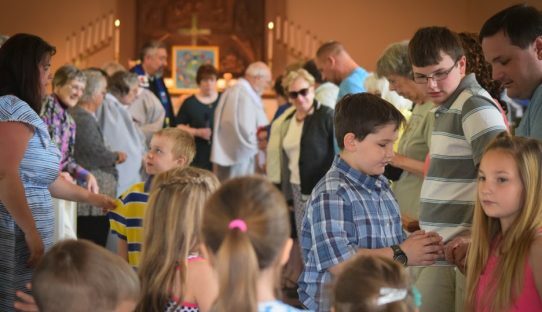 UCJ is a warm, dynamic, and exciting church that is driven by its mission to “grow our Christian faith through acts of love toward all.” Right now, our congregation is growing into a new, spirit filled time. Things are humming at the church—there is a positive energy in the air that comes from thoughtful preaching, great music and a beautiful family feeling. What does Church look like today? We have members, but its not a club. We have music but its not entertainment. We have sermons, but we don't have naptime. We talk of God, but we don't judge. The United Church of Jaffrey is a community based on the idea that we are created by and for love. This notion may be idealistic, but it's not naive -- it's challenging. Come see if UCJ is for you! The problem with associating spectacle with religion, is that spectacle does not like to share. It exists for its own sake.